When it comes to winter favorites, nothing beats curling up under a blanket and enjoying a cup of steamy, rich, and smooth hot chocolate. Are you one who would make this delicious drink from scratch, or are you like many others who resort to adding hot water to a pouch of instant mix? Find out what you’re missing if you are the latter! The “hot chocolate” made from an instant mix turns out to be a watery, dark colored liquid that is infused with a long list of additives. The editorial team agrees that the flavor is weak and that is excessively sweet. 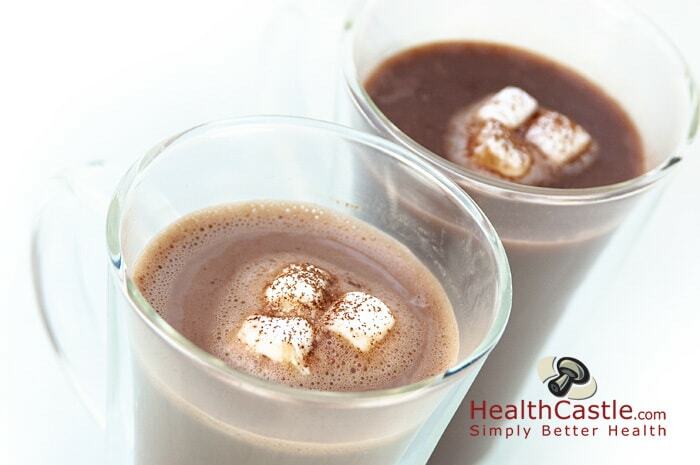 In contrast, by using three simple ingredients – milk, cocoa powder, and sugar – we created a rich, chocolaty, creamy drink. Because real milk is used, you get much more protein and calcium but less sugar and sodium out of this beverage. More importantly, by making your own you will also be able to avoid the hydrogenated oils (trans-fat) that lurk in the instant mix. All this for 2 more minutes in the prep and $0.40 extra – don’t you think it’s well worth it? It really is easy and simple to make a cup of real hot chocolate. Although it takes slightly longer to make, your body and your soul will both be nourished by the wholesome ingredients you chose. Place the ¾ cup milk in a small saucepan over medium heat until it is nice and hot. Meanwhile, in your mug or cup, make a paste with the cocoa powder, sugar, and the 2 Tbsp of milk. Pour the hot milk into the cocoa paste and stir until combined and smooth. You can place the hot cocoa in your blender (or use an immersion blender) to make it nice and foamy.